Caravans and their tow vehicles rarely jack-knife and roll over. But when they do, the consequences are severe. While countless ‘explanations’ are rife, the cause has long been known. It is not how rigs behave in normal driving; it’s all to do with how they behave in an emergency swerve, or when subject to a high side wind gust. Excess speed, however, is always a major factor. When cornering or swerving hard, or hit by a strong side wind gust, a vehicle does one of two things. It will either take up a slightly wider radius turn or, unless driver-corrected, it will increasingly tighten up that turn and ultimately jack-knife. These two conditions (see fig 1) are called understeer (good) and oversteer (bad). All road vehicles (except rare sports and rally cars) made since the mid 1930s are designed such that when laden as intended (plus some minor designed-in overweight margin) they mildly understeer. While few drivers are aware of this, understeer ensures vehicles automatically take up a slightly wider radius if cornered too fast. It also keeps vehicles straight on both flat and cambered roads. 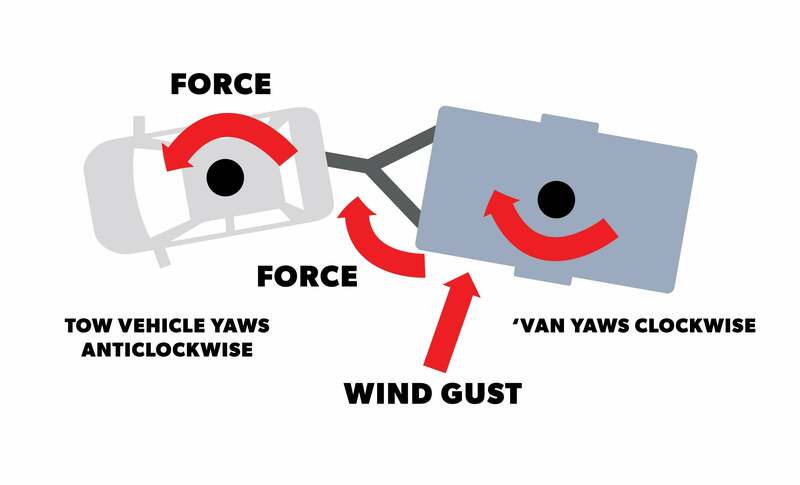 A caravan roll over results when its tow vehicle is triggered into oversteer, particularly if at speed. It is that simple. Its cause (and why fifth wheelers are not affected) is tow hitch overhang. This has been known since the 1920s by the heavy transport industry worldwide, but not, alas, by many a caravan maker (nor owner). Early (pre-1920) heavy transport used caravan-style trailers towed via a truck’s overhung hitch. This worked well enough at the very low speeds of that era but once they exceeded about 30 km/h, such rigs increasingly jack-knifed and rolled over. US industry-leader Fruehauf proved that the overhung hitch was the cause. Minimising overhang marginally increased permissible speed, but the issue was (and still is) inherent. As speeds increase, so do caravan roll overs. Consequent trials showed the issue could only be totally resolved by eliminating hitch overhang: i.e., locating the hitch directly over the tow vehicles’ rear axle/s. The fifth wheeler was thus born. It was adopted worldwide within a year or two. With rare exceptions, it has been used for heavy transport ever since. A fifth-wheel caravan is known to have been made in 1917 but just why is unclear. Many, however, were made in the USA in the early 1930s. As covered in greater depth (below) a conventional caravan and tow vehicle can, if the basic constraints are understood (or at least accepted), be made realistically stable at speeds up to about 100 km/h. But above that, even electronic stability control may not assist (the yaw forces become too high). Figure 2 shows why hitch overhang is such an issue. When the tow vehicle yaws (sways), it does not just permit but causes the trailer to yaw in the opposite direction. The greater that hitch overhang, the greater the resultant effect. 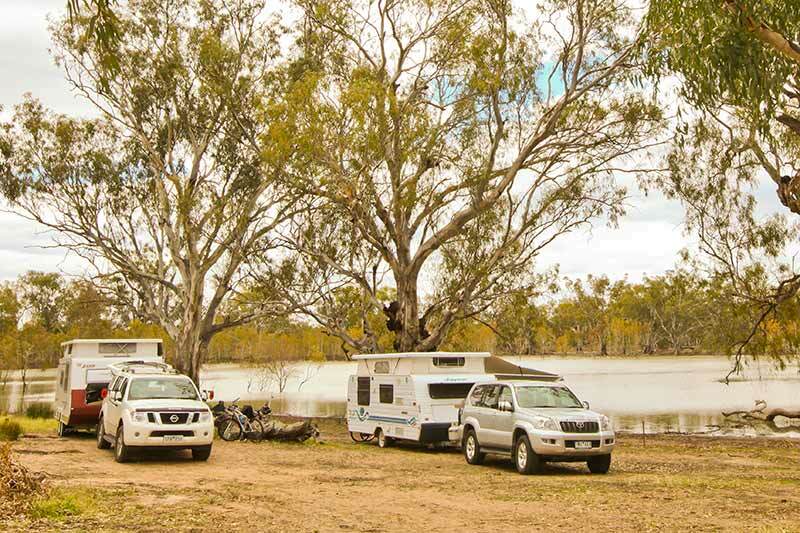 Most vehicles used for towing in Australia have an average hitch overhang of 1.24 metres. A few (mostly earlier) Land Rovers are far shorter and tow well accordingly. What really matters, however, is the ratio of that hitch overhang to the tow vehicle’s wheelbase (the distance from the front to rear axle). Here, US imports typically score well. Most have a wheelbase about 300 mm longer than the more typical 2.8 to 2.9 metres of most locally-popular dual cab utes. Their rear overhang, however, is still 1.24 to 1.3 metres. It is that longer wheelbase (not just their often greater weight) that makes vehicles like the Dodge RAM and big Fords such a good choice for towing heavy caravans. Equally important is the ratio of laden tow vehicle weight to laden trailer weight (and where that weight is in that trailer (it should never be at the extreme rear). Here, I can only support the Caravan Council of Australia’s advice of having that laden tow vehicle heavier than the laden caravan. If not, that mass-unbalanced rig may seem stable in normal driving but will become unstable (given sufficient disturbing force) at lower speed. Towball mass, too, is vital: 10% of laden caravan weight is really needed for any trailer longer than 4.5 to 5 metres. It must remain reasonably constant despite the amount of water in the tanks. That which truly matters is not how a rig handles in everyday use, it is how that rig acts in emergency swerves and high side wind gusts. Here, long heavy caravans towed by lighter vehicle are at higher risk. By and large (and as long as sensibly laden) a tow vehicle pulling an equally sensibly laden caravan that is no heavier than that tow vehicle is unlikely to be unstable — but never risk towing above 100 km/h as associated forces then truly escalate. If, however, the laden tow vehicle is lighter than the laden caravan, instability may manifest at lower speed. This is rarely obvious to the driver, but it is a serious issue in an emergency swerve or side wind gust, particularly while descending long slopes at speed. A major and widely overlooked factor in tow vehicle stability is its rear tyre pressure when towing. When a caravan is hitched up, its (essential) nose mass pushes down hard on the towbar. That, like pushing down on the handles of a wheelbarrow, increases the load on the tow vehicle’s rear tyres. That in turn increases their tendency toward oversteer. It is essential to run those tow vehicle rear tyres at a pressure that reflects that added load. This will typically be from 7-10 psi (50-70 kPa) higher. Never increase front pressure — reducing by 2-3 psi (15-21 kPa) actually assists while towing. In some cases, using correct tyre pressures alone can transform handling. Most instability issues, however, are the result of multiple minor issues that collectively become serious. Friction sway systems improve comfort at low speed. Any friction device is ineffective at speed. At 100 km/h, they have about 1% effect. This is because friction is linear, but the forces they attempt to dampen increase with the square of the rig’s speed. Dual-cam units keep the rig straight but may release suddenly when most needed. All such aids are like using a truss to support a hernia. Better by far to have that hernia removed. There is a good case for using AL-KO or Dexter electronic stability control, but only to safeguard an already stable rig. Both companies responsibly state their product “cannot overcome the laws of physics”. A short, heavy trailer (e.g., under 4.5 metres) is far more stable at speed than our typical 6 metre plus units. Minimise tow hitch overhang — even 10 mm excess is too much. A WDH is sadly essential for rigs that have a laden trailer more than a few percent heavier than the tow vehicle. It does, however, inherently reduce that rig’s ‘cornering power’ by about 25%. It is better by far to have a rig that needs no WDH (they are all but unknown in UK/EU). Never tow above 100 km/h — forces seriously escalate above that speed.